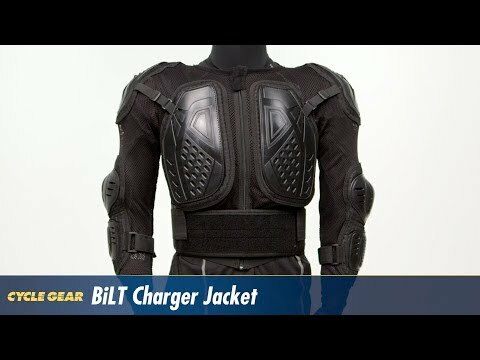 Superb fit and outstanding quality make the Charger the first choice for upper body protective gear. Stretch-mesh frame ensures maximum airflow while supporting hard-shell plates. EVA foam backed poly plates shield, elbows, shoulder and chest from impact. Integrated spine protector is articulated for maximum freedom-of-movement. Wide, elasticized belt ensures optimal fit for every body type. The Charger Jacket isn't as nice as the Fox or Apinestars, but, I still feel it's good protection should you need it. I have had it since the weather turned cold and I wear a Jacket over it. I do get hot-more as a result of the jacket than the ventilated Charger jacket. The mesh is showing some wear at the elbow seams where the padding and cup is stitched on, again this is because of my body anatomy. I'm tall and long, the elbow protection rides a little high on my arms causing strain on the seam when I flex my hand up toward my shoulders. I had originally ordered an XL but the body of the jacket was waay too big for my frame, I exchanged it for an L and I am pleased with it---WELL WORTH THE SMALL PRICE TAG! Since there is no sizing chart, I ended up with a jacket I could hardly put on. The armor looks tough but the mesh that holds it together not so tough. The mesh is supposed to keep you cool, so why make the jacket black to absorb solar heat? I returned it. I can't stand the plastic type chest protectors. I don't wear them. But with my kids riding, I want to show them that you need to wear protection when riding. So I bought one for me and for each of my kids. The sizes run a little small. I bought a XL. I am 5'10 220LBS. It's tight on my arms,across my shoulders and of course around my gut. I'm an ex athelete so a little bigger 220 than alot of people. It adjusts, but the forarm pads don't adjust enough. I am pretty happy with it as it isn't a huge plactic thing sticking up un my helmet and riding up onmy as I ride. It stays in place. You do need an under shirt as I found the fish netting to be a little itchy. Forarm, Elbow, Shoulder, chest, and full back protection for[$] bucks, how do you go wrong. I ride trails, woods and desert. No track for me. Got this because the great price and sturdy appearance. The overall quality seems pretty good. I lot of the lower priced compression suits have issues with a poorly stitched zipper, mesh that tears easily , or is hard to get out off. I bought two, one for me and one for my son. I purchased the sizes we normally wear and they both were too small. I would say that they are sized one size smaller then normal. I did, however, look over the build quality of the suit and was pretty impressed with it. The stitching was good, the zipper fit well and the mesh seemed pretty sturdy. If they had fit well, we would have been very happy with them. The stitching on this body protector is light which means over time you can literally tear of the back protector which is really annoying. 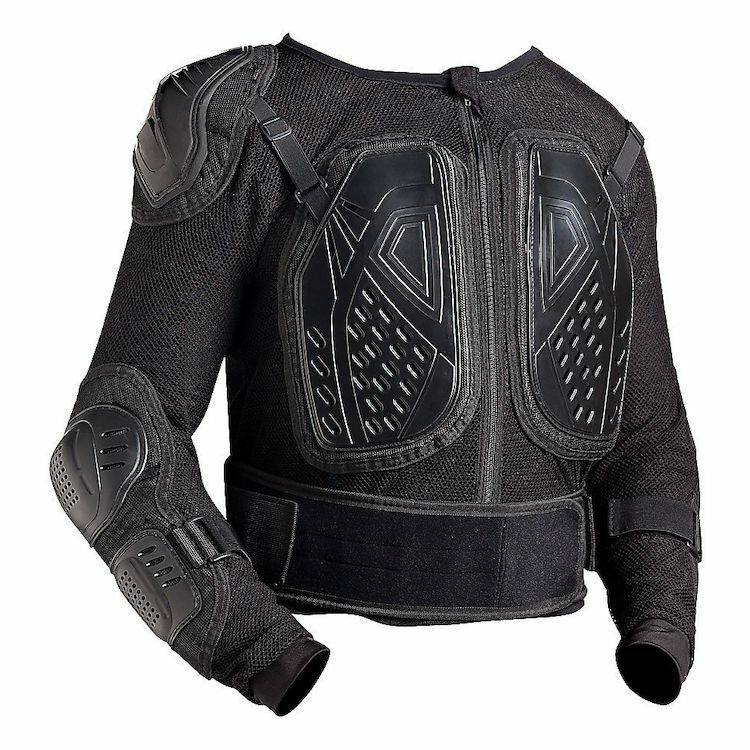 i recently had a crash going over 40mph and i slid, rolled and flipped, this body protector absorb the impact very well but left me sore after a day. The stitching problem was issue during the crash the whole back protector tore of when i slid and that was the first thing that happen but once it tore of my back, my back was exposed during the rest of the crash and when i flipped the back protector was not there to take the impact so i took the impact and left me in pain. I ordered a 2XL and the elbow pads were 6" past my elbow too small. I put it on my wife and the elbow pads were too small for her and she wears a women's medium! The worst fitting piece I have ever bought! I purchased this jacket for protection off-road. If I am riding on the road, I wear this under another jacket. I have gone down off-road and the elbow,shoulder pads, and spine protector saved me from hard rocks, so glad I had invested in this protection. I ride off-road about 10-20% of the time, so this fits my needs perfectly. The Fox, EVS and other high end jackets would probably be more suited for a rider that spends more time off-road. Purchased for upcoming camping/dirt bike riding in the summer. Haven’t put thru any riding tests yet but looks like it will do the trick!